In Norman times villages and small towns were generally ruled by the local Lord of the Manor because at that time with poor communications and the distance from the Sovereign’s jurisdiction, there was little national control. Over time Parish Priests and sometimes Schoolmasters and other literate men joined the Lord of the Manor to form a kind of ruling body. These groups were the first effective local councils and their meetings became known as Vestry Meetings. By the Year 1601, Church Vestry Meetings were so organised and workable that it was quite natural for legislators to give them the responsibility of levying the poor rate. These were the first effective local taxes. Everyone in the parish was entitled to attend Church Vestry Meetings but in practice the work fell to a few individuals, rather like Parish Councils today. Although the 1834 Poor Law Amendment Act removed from Parish Vestries the responsibility for poor relief and handed it to Poor Law Unions, parishes had naturally accumulated responsibility for administering local charities, managing commons and other land as a consequence of the 18th Century Enclosure Acts. Up until 1894 the affairs of the parishes continued to be administered by the vestry meeting dominated as they were by the squire, the parson and the principal landowners. Although theoretically open to all inhabitants these meetings were in effect open mainly to those deemed suitable to serve. In 1894 for a variety of reasons, including better education, a general movement towards greater ‘democracy’ and a desire to break the power of the Church of England over the lives of nonconformists and non-believers, a Bill was promoted to create Parish Councils. Much has changed since 1894, and ParisThe great Victorian Prime Minister, W.E. Gladstone, piloted the 1894 Local Government Act through the House of Commons. After a difficult passage through parliament and many amendments, this Bill became Law and Parish Councils were formed. The effect was to transfer all non ecclesiastical functions from the church to elected Parish Councils. Some other functions were added, such as those relating to the burial of the dead, which had, many years before, been vested in Burial Boards. Under the 1894 Act Parish Councils were to receive their income from rates levied on agricultural land, but this was a time of agricultural depression and the money raised was so very low that soon this system was abandoned. Householders were then rated; something householders had never experienced before, and unsurprisingly this lead to some opposition to Parish Councils. It wasn’t until after the first World War that Central Government began to give serious responsibilities to Parish Councils. The earliest among them being the h Councils are now closely regulated. The amount of administrational bureaucracy and red tape has increased exponentially in the past few years, with an accompanying rise in the costs of audit and insurance. Lines of responsibility are more clearly drawn and church and parish councils often work together. The Local Government Act, 1972, is the Act most often referred to when describing the modern powers and responsibilities of Parish Councils but it is augmented by many earlier and later Acts. For example - The Criminal Justice and Public Order, Act 1994, which, on the face of it, would not appear to relate to Parish Councils gave them a long needed ability to pay for measures to combat crime and the fear of crime in villages. Parish Councils may only spend public money on projects or actions for which they have a Statutory Power. Breaking this rule is likely to result in a Parish Councils accounts being refused by the auditor and, possibly, the individual councillors being required to repay the money illegally expended. (A list of the legislation conferring some of these powers will be provided in the Magazine next month) .There is still, as there was in 1894, only one power which the Parish Council must consider using and that is to “provide allotments for the labouring poor”, if asked for them. All other powers are voluntary - the Parish Council is not obliged to exercise them and indeed the majority would find it difficult to raise enough money to exercise them all on a permanent basis. Parish Councils are empowered to raise money for their activities through a tax (the “precept”) on the village residents which is collected on their behalf by Wiltshire Unitary Council, as an addition to the Council Tax. This is then paid to the Parish Council in two equal instalments. Two neighbouring Parish Councils might require the same amount of money to function but the fewer houses there are in a village, the more each household is obliged to pay towards raising this sum. The actual tax paid by similar houses in neighbouring villages can therefore differ widely. Though not actually ‘capped’ in their expenditure, as are the Principal Councils, the activities of many smaller Parish Councils are effectively limited by this difficulty: to what, in modern parlance, ‘the market can stand’. To combat this, smaller councils often try to combine with other neighbouring parishes for some large projects and share the expense across a wider base. Borrowing is allowed, up to a prescribed limit and with permission, but this is of limited help to a small parish because, of course, the loan (plus interest) has to be repaid from slim resources. Grants may be obtained for specific purposes from various sources, not least the Unitary Council. Very few, if any of these, can be used for maintenance or general administration purposes. Limited fund raising can be done but this is so hedged about by restrictions that, in the main, it is hardly worthwhile for a very small council. Some larger councils are lucky enough to own property from which a considerable income is obtained. The civil parish (as opposed to an ecclesiastical or church parish) is an independent, local democratic unit for villages and smaller towns, and for the suburbs of main urban areas. 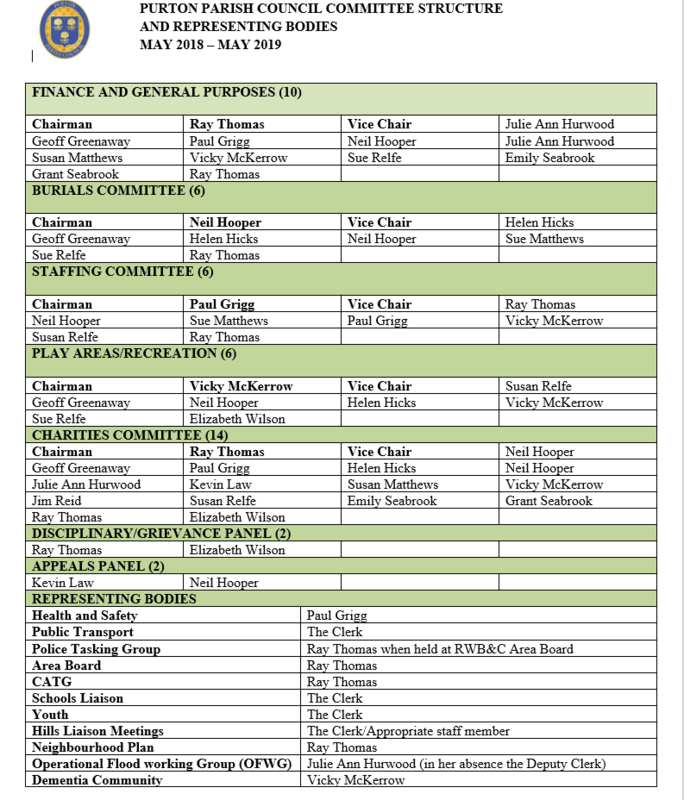 The Parish Council is the most local tier of administration and the first tier of democratic government and each Parish Council is in effect a small local authority. Its councillors are elected for four years at a time, in the same way as for other councils. The next local elections for Purton Parish Council will be in May 2021 though by-elections may be held to fill vacancies occurring between elections. Co-option may also be used to fill casual vacancies. WHAT ARE THE POWERS AND RESPONSIBILITIES OF PURTON PARISH COUNCIL? The Parish Council has more formal powers and responsibilities than most people realise. We are consulted and comment on all planning applications within the parish. We are consulted by and liaise with the Unitary Council over all issues affecting the parish and sometimes wider community - particularly over planning, traffic and road issues. We monitor street lighting, can provide allotments, and as Sole Trustees of the village charities, look after the play areas and other village amenities. We provide and maintain bus shelters and safeguard footpaths and rights of way. Again as trustees we are also involved in the provision of halls and meeting places. We may provide guides or leaflets for newcomers and from time to time we make village surveys. We can provide car and cycle parks and also public conveniences, litterbins and public seats. We can also prosecute noisemakers or litter bugs. Many appoint charitable trustees. We manage the cemetery and have taken over maintenance responsibility for the churchyard in response to a request from the St Mary's Parochial Church Council. We have the power to improve and maintain the quality of village life by spending sums of money on items and projects, which, in our opinion, are in the interests of the parish or its inhabitants. The Parish Council may do these things either directly or by helping others (such as volunteers or a charity) to do them. Purton Parish Council makes regular grants to appropriate groups and charities whose role is to improve the quality of life for its residents. All Parish Councils thrive on volunteers. Each year the Parish Council elects a chairman who has the responsibility of controlling the business of each Parish Council meeting and ensuring that all Parish Council business and meetings are carried out lawfully with all who are entitled to speak being given the opportunity to do so. He/she is an ex-officio member of all sub-committees and represents the Parish Council at official functions and occasions. The Parish Clerk, who is the Council’s chief executive, manages the council offices and staff, takes the minutes at council meetings, advises councillors, carries out the approved policies of the council and ensures the accounts are properly kept and audited every year. Parish Councils are the cheapest and least bureaucratic kind of local authority. As already explained Parish Councils are funded by a small part of the council tax and get no general government grant, so they have every incentive to ensure that they give and get value for money. Budgets are set and strictly controlled and the precept (or local rate) is set annually. There does seem to be a general nationwide disillusionment with the democratic process and a feeling that the man in the street can’t really affect anything. In addition our lives certainly seem busier and more complicated. However if anyone out there could spare a couple of hours a week helping to do a necessary and worthwhile job then the role of Parish Councillor can be rewarding and might even help you to wind down and to put life into perspective. We currently have 1 vacancie so if you do have the interest of your community at heart do consider putting yourself forward. If the number of councillors continues to fall we will be at risk of losing control of our own local affairs and others will be making more decisions for us. The choice is ours. Please contact the Parish Clerk or any councillor for more information. All Parish Council meetings are open to the public and these meetings include a regular slot where parishioners can ask questions. An Annual General Parish meeting for all parish electors has, by law, to be held every year (usually in March, in Purton) at which reports on the previous year are made and at which parishioners can raise items of query or concern.